This area of our basement is like a little nook and was originally where we stored a bunch of junk (most of it left by the previous owners). Craigslist is a wonderful thing! We got rid of all the miscellaneous building materials years after moving in and having not used any of it. This was before the woodworking bug bit me. 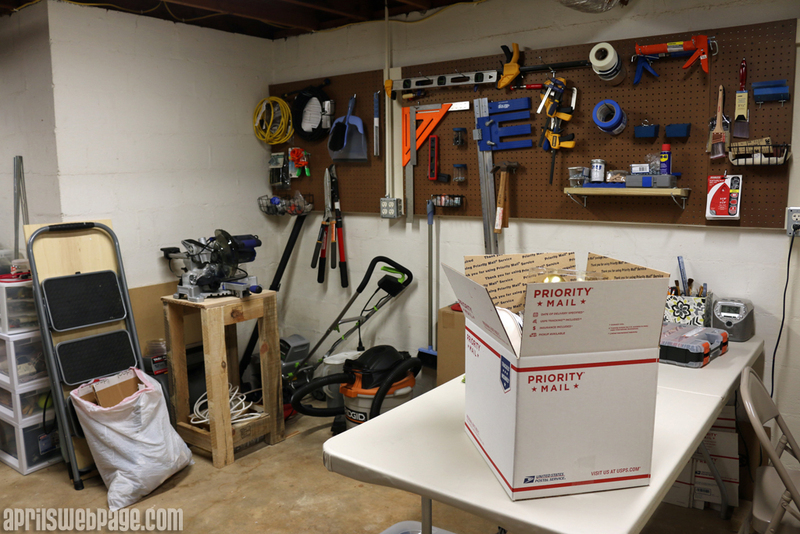 Once we got rid of the excess junk, we used the area to store our gardening tools and chemicals and my makeshift crafting area (on the opposite side, unseen in the picture below). I would soon discover that my crafting area wasn’t sufficient, and my woodworking hobby would require that I take over the whole nook. 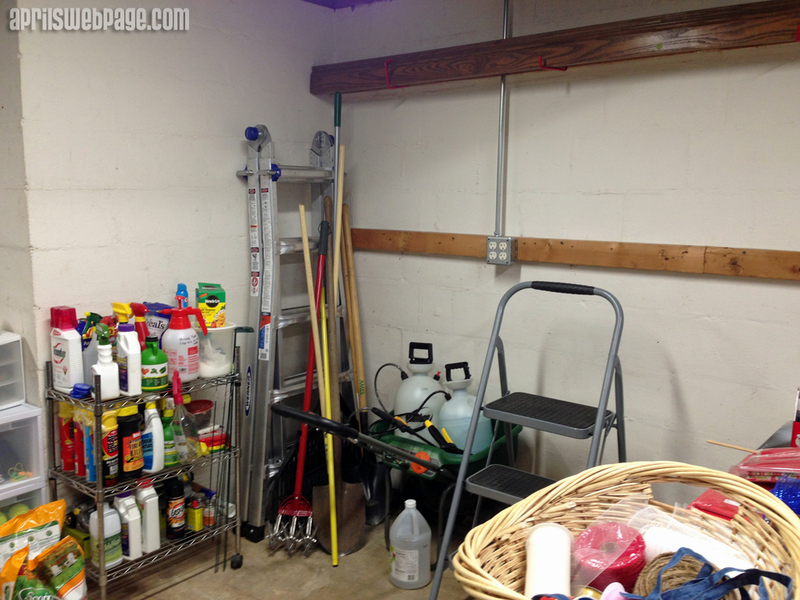 I found somewhere else to store the gardening tools and chemicals (which was a challenge in and of itself), so the next step in turning this area completely into my crafting and woodworking area was actually putting up the pegboard over the horizontal 2×4’s that were already attached to the wall, which you can see below. Once that was complete, I cleaned the wall and used Behr’s Masonry, Stucco & Brick Paint in Raffia Cream to paint the walls. Next would be the floors, and I was disappointed by how much the polyurethane changed the color. 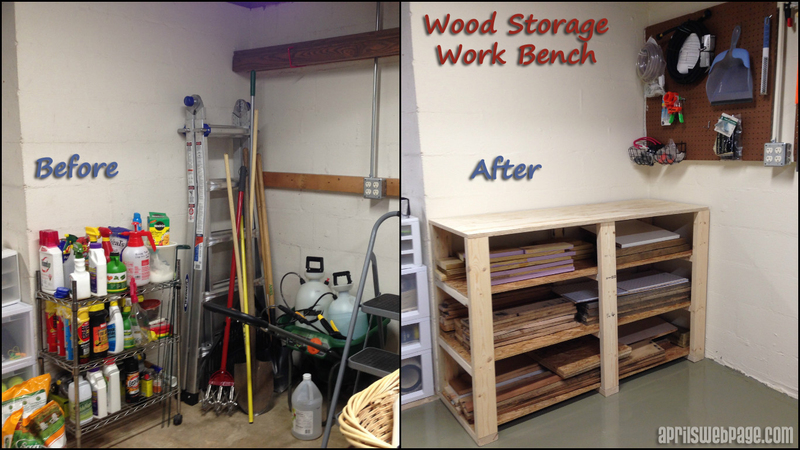 Once the floors were finished, I had to figure out some type of wood storage system. With my newfound hobby and interest in woodworking last year, wood scraps and pieces had started piling up quickly, and I really didn’t have a decent way of storing them. 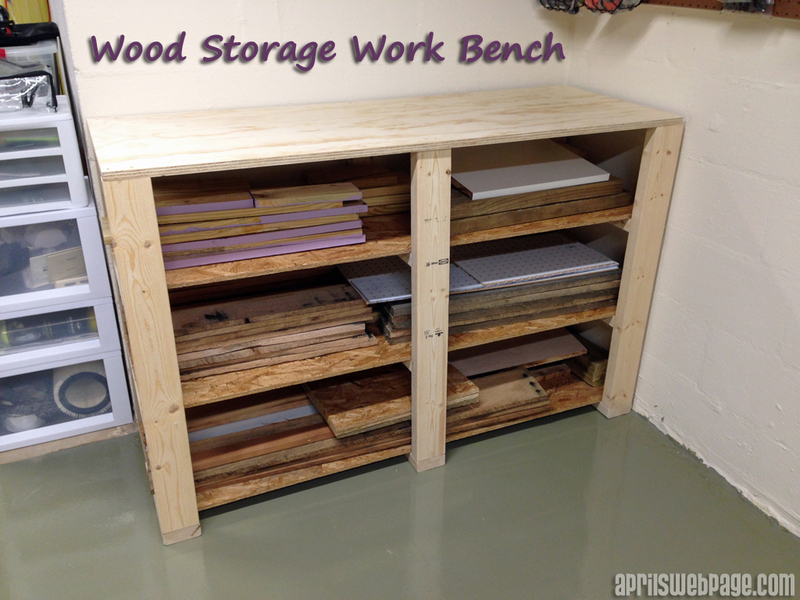 I scoured Pinterest for wood storage ideas and finally settled on something close to what you see here on The Family Handyman‘s website (project 4: workbench with build-in storage). I didn’t build the back section for larger pieces and sheet goods since the wall it was going against was only 54″. 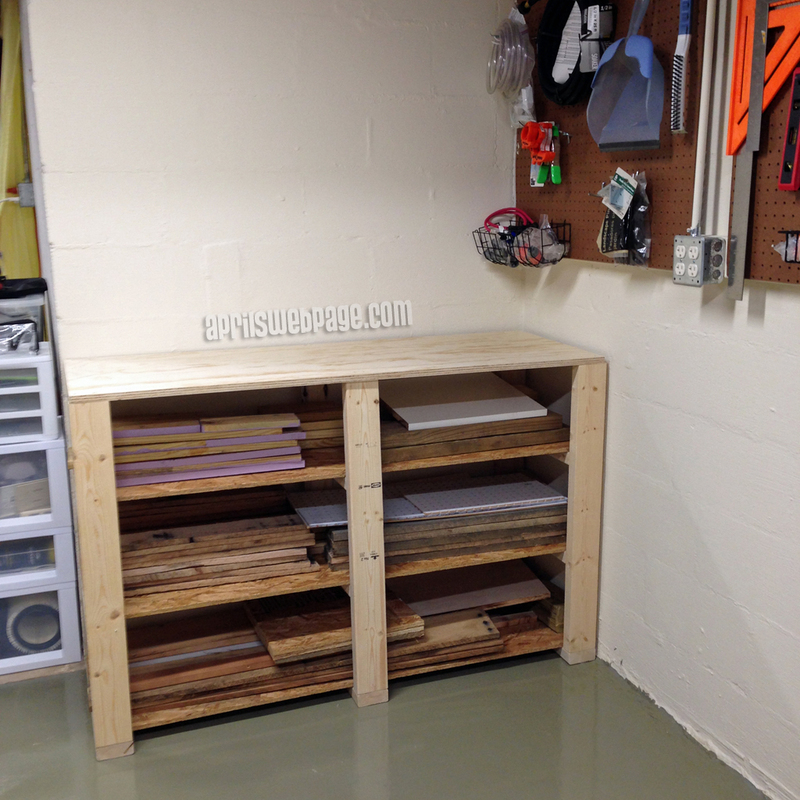 I only had to buy the 2×4’s and the top sheet of plywood (3/4″ thick cabinet-grade plywood). My dad does a lot of woodworking projects, and he had several sheets of the OSB plywood he’d bought but never used. 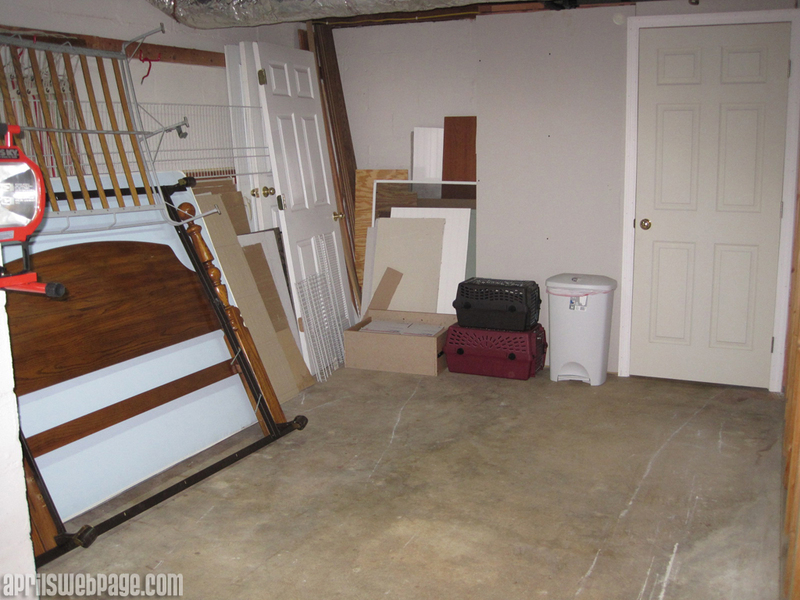 It’s not ideal for storing heavy pieces of wood, but each section is only about a 22″ span, so it will work for the time being. 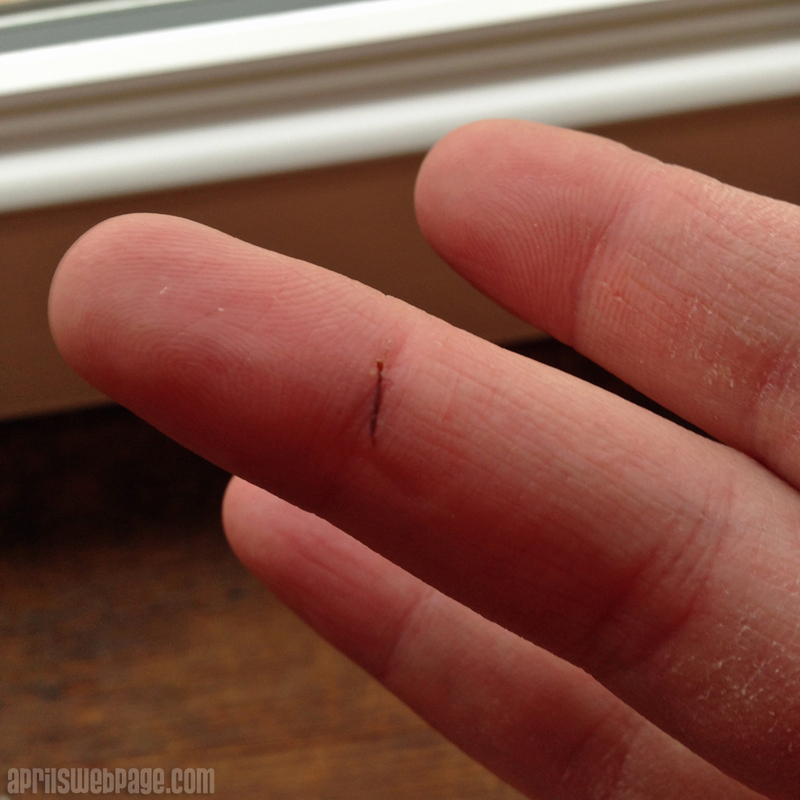 I also managed to get one hell of a splinter in one of my fingers from the OSB plywood. I thought I’d never get all of it out. A piece of advice: wear work gloves when dealing with OSB! It took a couple days and a little cutting away of the skin since the OSB material isn’t as stiff as the wood from a 2×4 or a more solid piece of wood. I’m a little late in getting this posted since I finished this project in February, and in hindsight, this isn’t the most ideal way to store the wood either. These pictures were taken in February when it was completed, and the storage bench is completely full, making it hard (if not impossible) to know exactly what I have in there. I suppose I should find some projects to utilize what I have, but that is a challenge for another day and when I have more experience. I had hoped to be finished with the entire area by now, but I never seem to have time to work on it. The next item on the list was revamping my crafting supply corner, which I also finished in February. I will share those details with you next week.